This ongoing section of our web site is dedicated to keeping you up-to-date on our artists. March 14th: Jim Byrnes releases an album of songs inspired by his hometown St. Louis Missouri called St. Louis Times on Steve Dawson's Black Hen Music label. January 20th: Jim Byrnes wins Male Vocalist of the Year at the MapleBlues Awards in Toronto. December 27th to January 11th 2014: The Sojourners, C.R. Avery and Paul Pigat tour Australia to great reviews. September 15th: The Sojourners release their latest CD Sing and Never Get Tired on the Little Pig Records label, produced by Paul Pigat. October 28th:The Vancouver CD Release Party for I Hear The Wind in the Wires at The Electric Owl. September 18th: Jim Byrnes releases an album of songs from the golden age of country music called I Hear The Wind in the Wires on the Black Hen Music label. September 3rd to 28th:Cousin Harley completed another of their annual tours of the Netherlands, Luxembourg and Germany. May 12th: Jim Brynes, The Sojourners and CR Avery appear at the Rogue Folk Club Silver Jubilee Concert in Vancouver, BC. October 28th:The Vancouver CD Release Party for I Hear The Wind in the Wires will be at The Electric Owl. May 16th to 28th:Cousin Harley returned to the Netherlands, Germany and Luxembourg to rave reviews. November 23 : Cousin Harley will join Brian Setzer's Rockabilly Riot on their western swing in December. Confirmed appearances to date: Dec 22 - Seattle, WA; Dec 23 - Grand Ronde, OR; Dec 24 - Vancouver, BC; Dec 27 - Edmonton, AB and Dec 28 - Calgary, AB. October 23: The Sojourners sophomore album wins the Western Canadian Music Award for Outstanding Contemporary Christian/Gospel Recording. March 26th: Chris 'Old Man' Luedecke won the 2011 Juno Award for Best Roots and Traditional Album Solo this weekend in Toronto for his most recent recording, My Hands Are On Fire and Other Love Songs. It was produced by Steve Dawson, and released on Steve's Black Hen Music label. March 26th: Jim Byrnes wins the Juno Award for Blues Album of the Year for Everywhere West. This is his third win in the category. February 2nd: Jim Byrnes and The Sojourners were both nominated for Juno Awards for their 2010 Black Hen Music releases. November 22nd: The Canadian Folk Music Awards winners are announced, and Steve Dawson picked up a trophy for Producer of the Year for his Things About Comin' My Way - A Tribute to the Mississippi Sheiks. November 14: CD release concert for Everywhere West at CBC Studio 40 in Vancouver, BC. November 5 to 13: Jim Byrnes tours Alberta & BC with Steve Dawson. November 2nd: The Maple Blues Awards nominations are announced, and Steve Dawson is nominated for Guitarist of the Year, and his Things About Comin' My Way - A Tribute to the Mississippi Sheiks is nominated for Album of the Year. Jim Byrnes is nominated for Male Vocalist of the Year. October 24: Jim Byrnes won Blues Recording of the Year at this year's Western Canadian Music Awards in Kelowna, BC. October 22 to 31: Jim Byrnes tours the Netherlands with Steve Dawson and The Sojourners. October 19: Jim Byrnes' new recording Everywhere West is released on the Black Hen Music label. September 21: Black Hen Music releases a DVD documenting the performances of Steve Dawson, The Sojourners, Jim Byrnes, and many others as part of the All Star Tribute to the Music of the Mississippi Sheiks at the Capilano Theatre. It will be released in Canada, the United States and Europe. 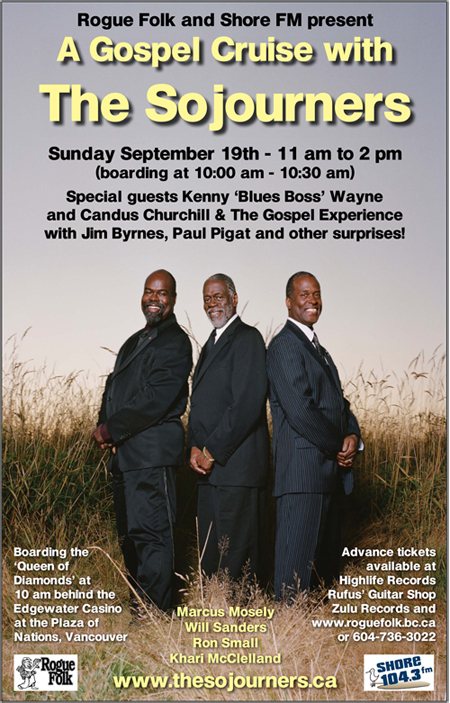 September 19: The Sojourners cast off on a Gospel Cruise in Vancouver with special guests Kenny 'Blues Boss' Wayne and Candus Churchill & The Gospel Experience. Jim Byrnes and Paul Pigat will be aboard too, along with other surprises. See a poster here. July 22 to 31: Cousin Harley blasts their way through Belgium, The Netherlands, Germany and Italy. July 9 - August 8: Steve Dawson takes his Tribute to the Music of the Mississippi Sheiks to folk festivals in Winnipeg, Vancouver, Calgary and Edmonton as well as the Ottawa Blues Festival. Jim Byrnes and The Sojourners also appear on some of these dates. May 18 : Cousin Harley's fifth album It's A Sin was released in Canada. As usual, the well-travelled band are continuing on the road in support of the record in July and beyond. Dates include a Western Canadian swing and several European tour dates. May 12: Steve Dawson, Jim Byrnes and The Sojourners appear with over a dozen other musicians and singers at the Capilano University Theatre in North Vancouver as part of an All Star Tribute to the Music of the Mississippi Sheiks. March 19 to 27: Jim Byrnes tours Germany and Belgium with The Sojourners. February 22nd : Jim Byrnes is nominated for a Canadian Indie Music Award for Favourite Blues Act. January 14 to 17: Paul Pigat performed a series of acclaimed shows at the NAMM (National Association of Music Merchants) show in Los Angeles, CA on behalf of Gretsch Guitars. November 10: Paul Pigat releases his debut solo acoustic CD. Boxcar Campfire features a collection of songs about love, heartbreak, and redemption; mostly self-penned tunes along with a handful of creatively arranged covers. Although laced with tasteful musicianship, this recording is a departure in the sense that the songs rather than the playing are showcased. September 17-20: The Western Canadian Music Awards will take place in Brandon, Manitoba. See www.westerncanadianmusicawards.ca for more information. July 14: The nominations for the 2009 Western Canadian Music Awards were announced, and Steve Dawson picked up four. His CD Telescope is up for Instrumental Recording of the Year. His Waiting for the Lights to Come Up was nominated for Solo Roots Recording of the Year. Steve Dawson is in the running for Producer of the Year (that's the third Year in a Row) and his Black Hen Music is up for label of the Year (also 3rd Year in a Row). Congratulations, Steve! May 12th: Jim Byrnes' new recording My Walking Stick was released on Black Hen Music. April 26th to May 6th: Jim Byrnes tours Germany and the Netherlands for the first time ever, with his band, Steve Dawson and The Sojourners. April 24th to 30th: Jim Byrnes, Steve Dawson, Cousin Harley, Jodi Proznick and The Sojourners will all be appearing in Ottawa as part of the National Arts Centre’s BC Scene, the largest-ever gathering of BC artists outside the province. For more information please visit www.bcscene.ca. April 7th: Jim Byrnes and The Sojourners joined other environmentally aware performers from around the world to perform in Montreal at 7 Continents, 1 Earth: A CBC/Radio-Canada Earth Day Celebration. Listen to it here on CBC Radio 2 Concerts on Demand. January 27th: Let Freedom Sing, a Time-Life 3CD on the music of the Civil Rights era is released. It includes a track called Eyes on the Prize, by The Sojourners. Buy it here at Barnes & Noble. October 30th: The Sojourners were nominated for a MapleBlues Award in the New Artist/Group category. October 30th: The Sojourners were selected to appear at the MapleBlues Awards ceremony on January 19th in Toronto. October 18th: Steve Dawson won a Western Canadian Music Award for Producer of the Year. October 9th: Steve Dawson was nominated for two Canadian Folk Music Awards for 'Waiting for the Lights to Come Up', in the 'Producer of the Year' and 'Pushing the Boundaries' categories. 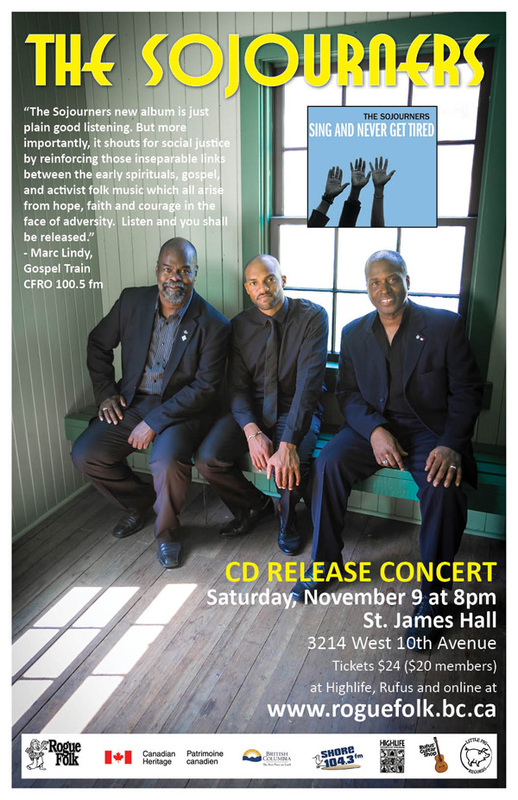 October 9th: The Sojourners were nominated for a Canadian Folk Music Award in the Vocal Group of the Year category. September 15 : Steve Dawson was nominated for a Western Canadian Music Award for Producer of the Year. In addition, Black Hen Music is nominated for Independent Label of the Year. .
September 15 : The Vancouver CD release show for Steve Dawson's 'Telescope' CD took place on November 8th at the St James Hall. September 15: The Sojourners performed at the Western Canadian Music Awards festival in Edmonton on October 18th at The Artery. They have also been selected to perform on the WCMA show on October 19th. September 15: Steve Dawson and Jim Byrnes head out on the "Fathers and Sons' tour of western Canada with Doug Cox and Amos Garrett, November 19th to 30th. September 15: Paul Pigat performs at the Western Canadian Music Awards Festival on October 18th at Jekyll & Hyde’s in Edmonton. September 15: Cousin Harley performs at the WCMA Festival, on October 17th at The Urban Lounge in Edmonton. September 14: Jim Byrnes emerges from the studio after recording a new CD, again produced by Steve Dawson. September 1: ‘Eyes on the Prize’, a track from The Sojourners' Black Hen CD ‘Hold On’ was selected for inclusion in an upcoming Time-Life compilation on the Civil Rights era. September 1: Look for Paul Pigat's new acoustic CD ‘Boxcar Campfire’ to be released soon. There will also be a new Cousin Harley CD recorded this fall. August 20 : Steve Dawson releases the all-instrumental ‘Telescope’ on September 9th..
August 15: Steve Dawson began work on a tribute album to the 1930's blues band The Mississippi Sheiks. To be released on Black Hen later this year, it features acclaimed artists Ry Cooder, Bruce Cockburn, Bill Frisell, Kelly Joe Phelps, John Hammond, and more. July 31: Steve Dawson is nominated for WCMA Producer of the Year and his Black Hen Records is nominated for WCMA Label of the Year. April 8: Jodi Proznick is the winner of three National Jazz Awards – Bassist of the Year, Acoustic Group of the Year and Recording of the Year, for ‘Foundations’ on the Cellar Live label. December 8: Jodi Proznick was nominated for a Juno Award, in the Traditional Jazz category. October 18: Jim Brynes' 'House of Refuge' CD featuring The Sojourners picked up the Western Canadian Music Awards trophy for Outstanding Blues Recording.